Bsc, MS, PhD, CuD, DSc, CBiol, FIBiol, FInstPM, SS, OGW, MBS. Chief Research Officer, Director,Chief Eecutive: Kenya Medical Research Institute (KEMRI). He is also a Professor of Immunology & Molecular Medicine. DAVY KIPROTICH KOECH (born 1951) is a founder member, Chief Research Officer, Director and Chief Executive, Kenya Medical Research Institute (KEMRI), a state-owned organization charged with the responsibility of carrying out health sciences research in Kenya. 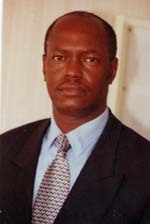 He has been a member (1985-90), the Vice-Chairman (1990-95) and the Chairman (1995-2003) of the Commission for Higher Education; and the Vice-Chairman (1993-2003) of Council of the Jomo Kenyatta University of Agriculture and Technology, Kenya. He is best known for his direct contribution in research that, in 1990, led to the novel development of the drug, based on a formulation of a low-dose interferon alpha, for oropharyngeal use in the clinical management of HIV infections and AIDS as well as of viral hepatitis and related viral infections. He is also known for his pioneering work in the perfection of HLA tissue typing technique that led to the first living donor-related kidney transplant in Kenya in 1985. He has further introduced the DNA technology for this purpose. Since then, renal transplants have been routinely undertaken in Kenya. Recently, he has participated in the development of an insulin formulation, which is potential for oropharyngeal use in the clinical management of insulin-dependent and non-insulin-dependent diabetes mellitus. He is also spearheading research into the clinical use of trioxolane in HIV/AIDS, rheumatoid arthritis, respiratory infections as well a number of cardiovascular diseases. Dr. Koech has also served in various committees of several international bodies including the World Health Organization, Commission of European Communities and the United Nations International Atomic Energy Agency. He has been a Member (2001-date) of the Data Monitoring and Ethics Committee (DMEC) of the Kenya-Oxford-London HIV Vaccine Trials sponsored by the International AIDS Vaccine Initiative (IAVI). He is also a founder member and a member of the Board of Directors of the Drugs for Neglected Diseases Initiative (DNDi), a Geneva-based international NGO. Dr. Koech has been decorated with many national and international honours and awards and holds office in several professional societies. Some of the awards are the Distinguished Leadership Award (1986), the Commemorative Medal of Honour (1987), The World Lifetime Achievement Award (1998) and The 2000 Millennium Medal of Honour issued by way of Warrant of Proclamation given in honour of his outstanding achievements and dedication to personal and professional goals, all by the American Biographical Institute (ABI); and three Presidential awards (State investitures): the Silver Star (SS) of Kenya (1984), the Order of the Grand Warrior (OGW) of Kenya (1989) and the Moran of the Order of the Burning Spear (MBS) (1998), for his distinguished service to the nation. He is also the National Chancellor for Kenya (1993-date) representing the International Association for Educators for World Peace (NGO, UN and UNESCO). He is also cited in the International Register of Profiles and in the International Who is Who in Medicine, International Biographical Centre (IBC), Cambridge, England, from where he received a Certificate of Merit (1986). He is also one of the IBC nominees for the 1998 International Man of the Year and Most Creative and Successful Personalities of the World. In addition, Dr. Koech is a permanent Deputy Governor (DG)(1997-date) and Board Member of the American Biographical Research Institute Association. Dr. Koech was also selected by the Governing Board of Editors of the ABI as a great mind of the 21st Century due to significant accomplishments within the area of Health and Education, and listed in the reference premier edition of Great Minds of the 21st Century. Dr. Koech is also the 2002 nominee for the United Cultural Convention�s International Peace Prize, and the basis for nomination being his impact on the international level of understanding and willingness to share his talents with others. In addition, Dr. Koech is the nominee of the International Who�s Who of Professionals and the Ultimate Professional Directory has announced his selection as an Honoured Member of the WHO�S WHO Historical Society for the Year 2003. Dr. Koech is listed in the East African Standard�s Century Magazine (15 November 2002) as one of the Top 100 Achievers of the Century who influenced Kenya most. He is listed in the category of Teachers, Academicians and Educationists. Because of his commitment to excellence in public service, Dr. Koech is a recipient of a Gold Medal from the Geneva-based Foundation for Excellence in Business Practice. API*APN is�proud of this brilliant man’s achievements in life: Chief Editor Korir. This entry was posted on September 5, 2007 at 08:42 32	and is filed under AA > News and News analysis. You can follow any responses to this entry through the RSS 2.0 feed. You can leave a response, or trackback from your own site.